Backed by rich industry experience, we are offering a wide range of Hexagon Bolts with Hex Nuts across the globe. The offered range is procured from our reliable vendors, which is well tested by our vendors on various parameters. Further, these are manufactured using premium quality raw material, latest technology in compliance with latest market trends. 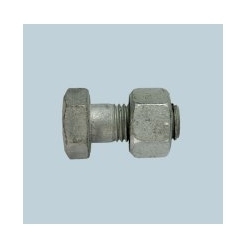 Our stainless hex bolts with hex nuts are broadly demanded in various industries for being dimensionally precise, corrosion resistant and durability. We are looking queries from Foreign Countries only. Backed by our rich industry experience, we are involved in manufacturing of CPVC AND UPVC REGIND and exporting and supplying an extensive assortment of Anchors, Fasteners, HandTools, S. S. Fasteners and Threaded Rods. Further, these products are fabricated using premium quality raw material by our reliable vendors. The offered range is generally used in various industrial and commercial areas, thus these are available in various sizes, shapes, designs and other varied specifications. Moreover, we maintain a strong vendor base from where our wide range is procured, which help us provide superior quality products to our clients. With the help of our team of professionals, we have become one of the main exporters of these industrial products across the globe.